We returned to the site to undertake further work along the new path linking Bowthorpe to Colney and the Norwich Research Park. 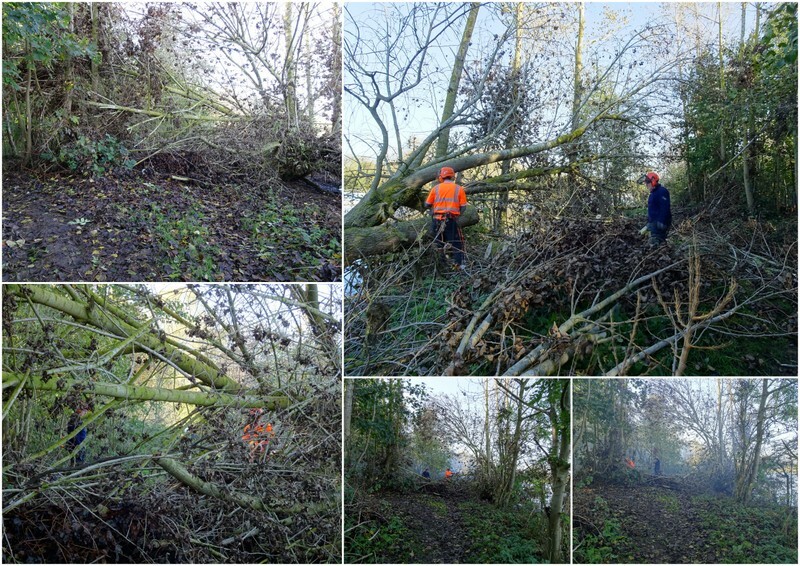 A new footbridge linking Bowthorpe Southern Park to Colney was completed in September (please see our blog – “A day in the Country and then off to the Pub!” where we reported on how our volunteers had fenced-off a culvert along the path). The Yare Valley Society had campaigned for a footbridge here for nearly half a Century and have appropriately dubbed it the “Bridge of Dreams”. It is a very attractive bridge and we found that, on the days we worked there, it is already being well used. 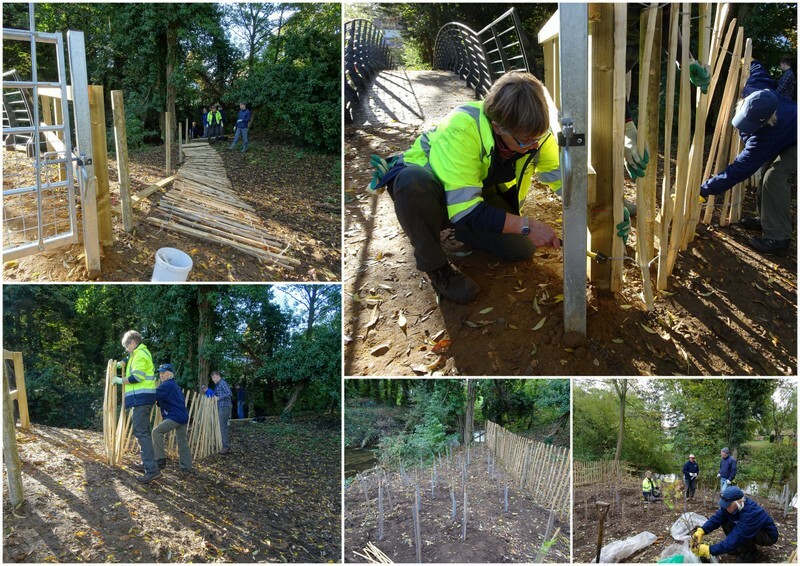 Our first visit on 18th October was to construct chestnut paling fences each side of the bridge on the Bowthorpe bank ready for planting new trees. Without the fence the horses that graze the site would eat any new growth and kill the trees. It was a bright and sunny day and the task was not too onerous. Knocking-in the posts was quite easy in the soft ground and attaching the wing-ends and paling fencing was straightforward but a bit fiddly to get the levels right. We made a return visit on 26th October to plant up a variety of young trees (whips) behind the fenced-off area. This was a new project to carry out some heathland management work. 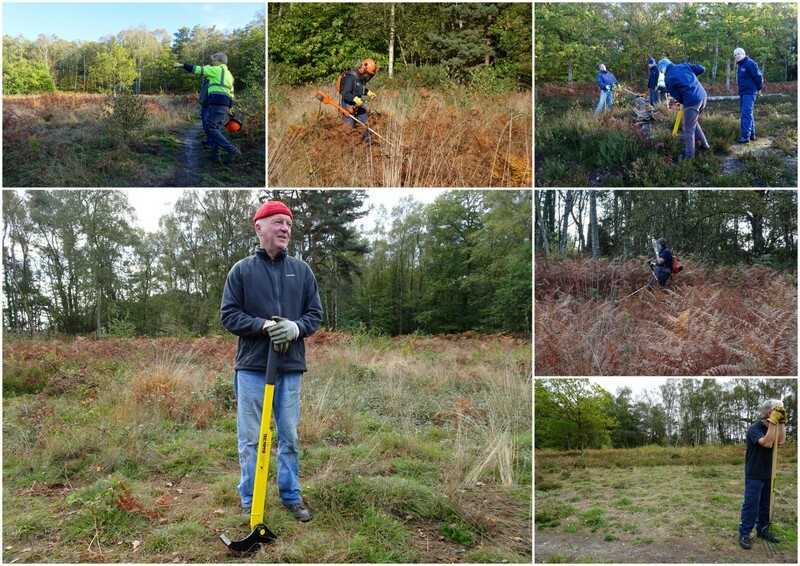 Our volunteers visited on 19th October and again on 25th to pull out bracken and brushcut the invasive grasses to reveal the heather underneath. The team tried out a new tree pulling device to remove the birch saplings which had started to take hold. The tool grabbed the base of the sapling and could be levered back to extract the tree and root. Todd’s Pond, or the Village Pond, is a large pond situated on the edge of the common where over time a large population of ducks (and their droppings) has reduced the pond’s biodiversity. 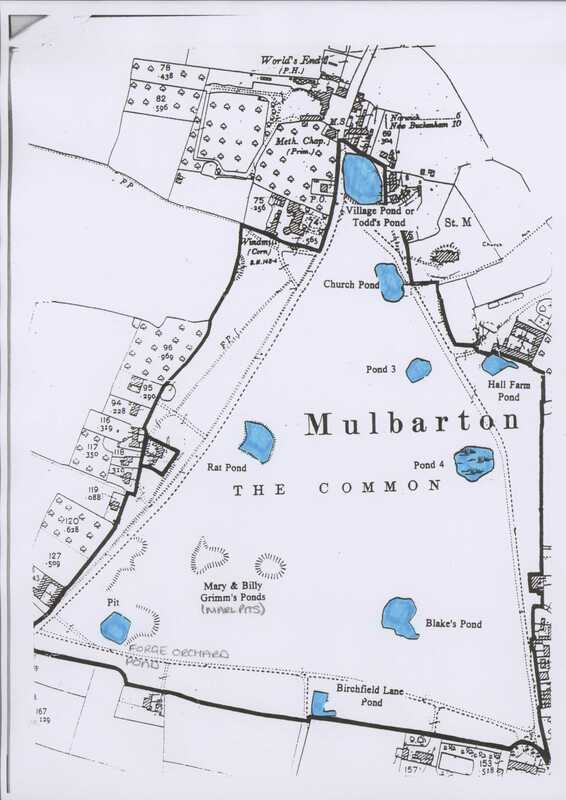 A map of the Common and its ponds can be found here. 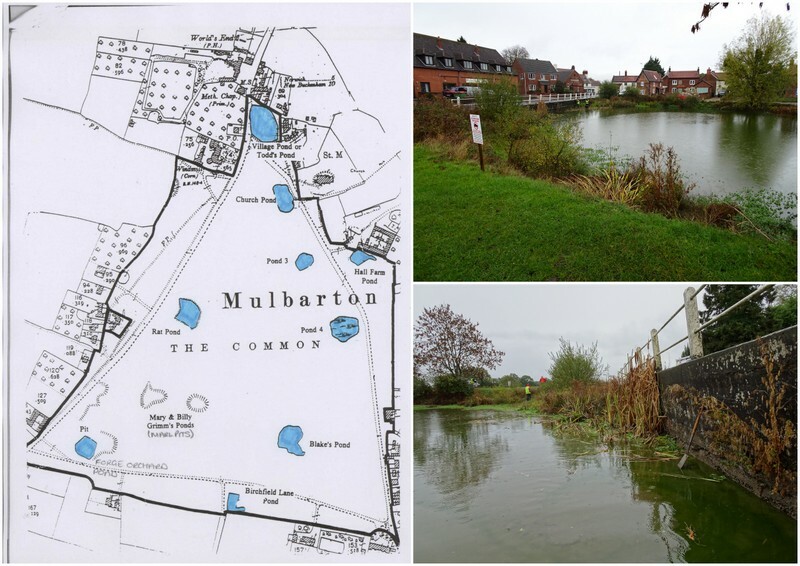 The plan is to improve the village pond water by transplanting some Common Reed, which will filtrate the water by allowing bacteria, fungi and algae to digest the droppings and thereby help clean up the water over time. 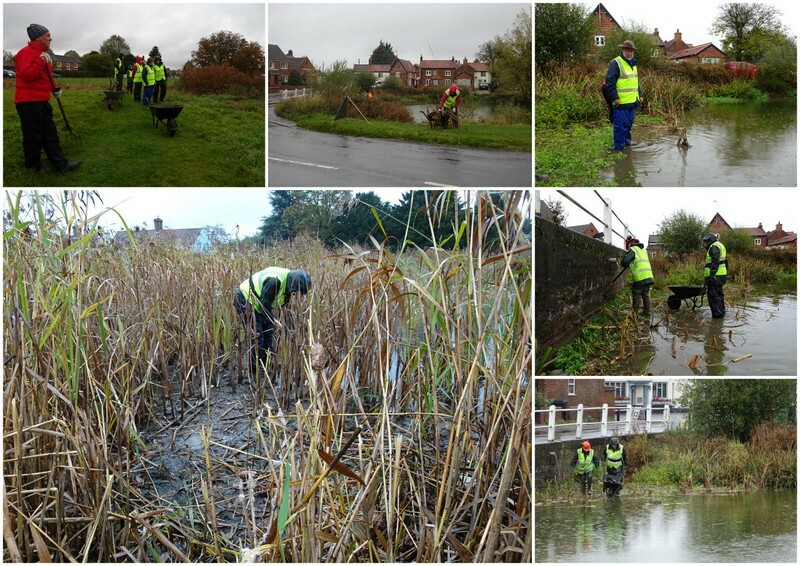 The nearby Church Pond has plenty of healthy reed so our task on 1st November was to transfer reed from one pond to the other. It was a very wet day, raining quite hard and not very pleasant at all! However, not to be deterred our volunteers set to work digging up blocks of reed from the (dryish) edge of Church Pond and carting it by the barrow-load to Todd’s Pond. A messy job – especially in the rain. The plan was to dig holes for the reed, but the bottom of Todd’s Pond was very stony and gravelly and difficult to dig out. We were working ankle deep around the edge of Todd’s Pond and we couldn’t see below the muddy water to see whether our holes were suitable. Anyway, we persevered and shifted a lot of reed from one pond to the other. We decided to stop at 1pm since we were all very wet and muddy and getting tired. I had a hole in my right welly which let in the cold pond water. My only dry clothing was my left sock – everything else was muddy and drenched. 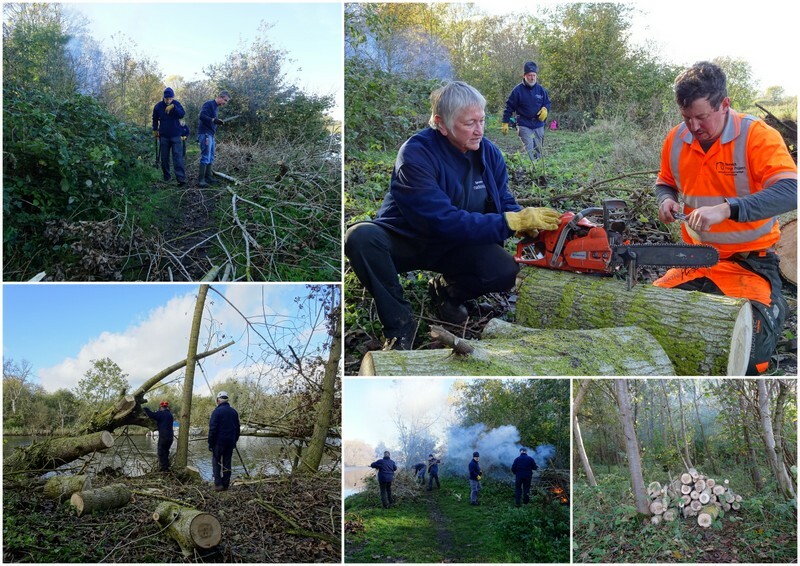 The following day was dry and a whole lot warmer and a visit to Whitlingham Marsh on 2nd November found us clearing up a large Aspen that had fallen across the footpath along the riverbank. It was a big tree which had fallen onto its neighbours and was partly supported by them. It was a tricky problem for Matt to deal with since it could react violently as the side branches were removed and the balance of its weight shifted. It had been blown over, so the weight of the root ball meant there was also a risk it could at some point fall back into its hole! The tree was carefully cut up and the brash burned with the larger logs stacked out of the way. The final part of the trunk was hanging over the riverbank and extremely reluctant to part company. It took several attempts to separate it before it finally fell onto the mud below the bank. It was cut into chunks and removed so as not to be a danger to river users. At the end of the day, the footpath was once again fully open for the many visitors to this area of Whitlingham. It was also good to have Liz back with us after recovering from a broken arm.